Early last month during the throes of E3, Lords of the Fallen developer Deck 13 announced that it was working on an all-new, yet-to-be-revealed IP that reportedly boasts sci-fi elements. Set in a dystopian future, it’s understood that the project itself is still incubating in the nascent stages of development, and though fans of the studio will understandably find that disappointing, they can now take solace in the fact that Gamescom will herald new information about the project. News comes by way of Videogamer, who reports that while it’s still too early in the game’s development cycle to warrant a trailer, publisher Focus Home Interactive will detail elements of Deck 13’s “premium action RPG” to the press. Featuring “innovative combat mechanics” and an “original character progression system,” there’s certainly reason to be excited for the studio’s latest outing, even though details are currently scant on the ground. 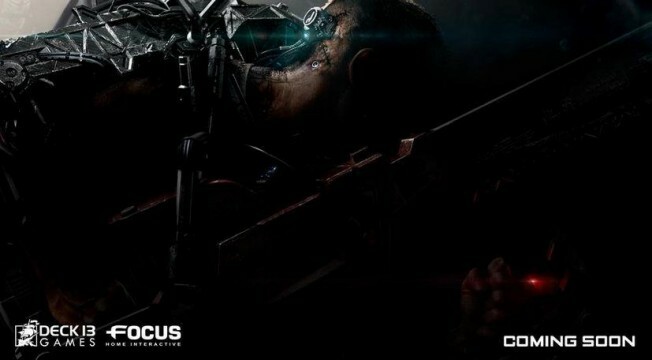 Back when the project was first teased, Focus Home and Deck 13 unveiled a dark screenshot that appears to hint at some form of futuristic weaponry and/or a human that has been mechanically enhanced. The jury’s still out on whether this is a case, but gaming’s hot-button trend for a dystopian future lately has been synonymous with these tropes. Leaving the fantastical setting of Lords of the Fallen behind, venturing into uncharted territory has meant that Deck 13 won’t be involved in the RPG’s sequel, who will instead pass the torch onto CI Games.